Sometimes There Isn’t Anything To Get is a fresh and innovative exhibition currently being displayed at the Nancy Sever Gallery in Canberra. It assembles thought-provoking and eye-catching artwork from artists Joel Arthur, Zoe Brand, Byrd (Daniel Maginnity) and Hanna Hoyne. 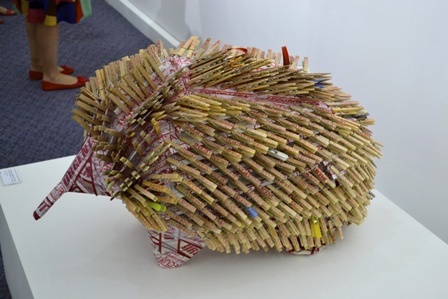 The walls and floor of the exhibition offer such wonders as a sculpture of an echidna made of wooden pegs (Hoyne) and a series of works presented under the interesting title ‘The self-aggrandizing echo chamber that is meta-slang’ (Byrd). Also featured are a formidable collection of illusionistic paintings by Joel Arthur and a series of signs/pendants by artist and jeweller Zoe Brand. On discussing the art scene in Canberra, Brand says, ‘There are so many arts precincts, all with different styles and crowds. It certainly lends itself to a wide range of views on the world, but I think occasionally the Canberra art scene needs to look outward rather than inward. Having said that, Canberra is a supportive scene and a great place to have an arts practice. The exhibition is not to be missed if you want to know what’s happening in contemporary Australian art right now. 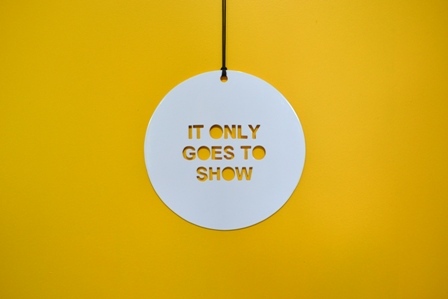 Sometimes There Isn’t Anything To Get is open Friday to Sunday, 11am to 6pm, until the 31st of January. This entry was posted in Art and tagged art, exhibition, Review. Bookmark the permalink.